Two signature sounds from Jordan are featured in the application! Want to jam with your friends? 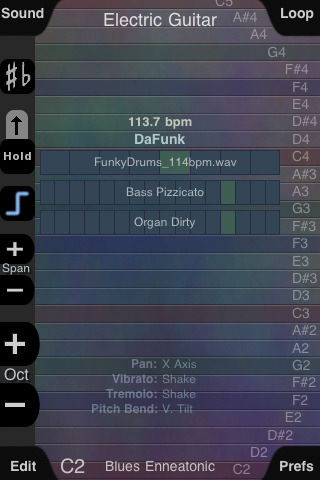 ThumbJam lets you broadcast tempo, key, and scale to other nearby devices via Bluetooth so you can play together live. Even better, you can use it as a MIDI or OSC controller over WiFi to control software instruments on your computer! Many more for immediate free download in the app including several drumkits, Mellotron instruments, slap bass and more! New instruments posted regularly. Version 1.3 fixes the lack of sound issue for iPod touch devices. It also adds native iPad support! This is just the beginning for the iPad version. Look forward to more updates that further take advantage of iPad-specific features. PLEASE update your reviews and ratings to reflect the capabilities of this version! Again, we are very sorry for the extended delay on this fix. Also if you have questions or suggestions, please ask on the forums at thumbjam.com or via email at support@thumbjam.com. We cannot provide feedback on iTunes App Store reviews, which is frustrating when we have the answers you need. Includes support for fast switching and background audio operation (if loops are playing) under iOS4. – A fixed loop length option lets you specify ahead of time how long of a loop you want to record in bars. You can now use ThumbJam as a MIDI or OSC controller over wifi for software instruments or midi sequencers on your computer. Look at the Prefs->Remote Control page to enable these features. For the MIDI output you will need to the DSMIDIWiFi server software on your Mac/Windows/Linux PC found at http://dsmi.tobw.net to receive the MIDI data. For best results connect your device and computer using an ad-hoc wireless network directly between them. See the forums at thumbjam.com for more detailed instructions, and for a description of the OSC messages sent. – Split-screen ability increases playable note space while also allowing for independent setting of key and note range per side. Toggle the split-screen feature from the key change popup in the key controls sidebar. – Sonoma Wireworks AudioCopy/Paste 1.1 support, allows for copying and pasting multiple simultaneous files.